SAN JOSE, CA--(Marketwire - Oct 29, 2012) - Cadence Design Systems, Inc. (NASDAQ: CDNS), a leader in global electronic design innovation, was presented two "Partner of the Year" awards from TSMC for the contributions Cadence engineers made in the emerging areas of 3D-IC and 20-nanometer chip development. The awards -- for "CoWoS Design Enablement and Test Vehicle Development" and "Joint Delivery of the 20-Nanometer Reference Flow" -- recognize the expertise, technology leadership and commitment Cadence brought to the table as it has worked tightly with its long-standing foundry partner to enable advanced chip design and manufacture. 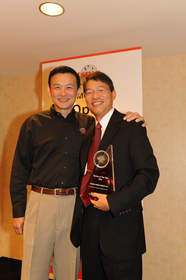 "TSMC's partner awards are testament to the power of collaboration," said Chi-ping Hsu, senior vice president, research and development, Silicon Realization Group at Cadence. "By working so closely together and for so many years, we are able to offer our customers an easier path past the most daunting challenges they face in the key areas of 3D-IC and 20-nanometer design. Whereas we proudly accept these awards, the real winners are our customers." "These awards recognize the engineering contribution from Cadence that has enabled 3D-IC and 20-nanometer design," said Suk Lee, TSMC senior director of the Design Infrastructure Marketing Division of TSMC. "Cadence continues to provide advanced technology and collaborates closely with TSMC to enable significant advances in semiconductor and system design." TSMC recently selected Cadence® solutions for its 20-nanometer design infrastructure. The solutions include the Virtuoso® custom/analog and Encounter® RTL-to-signoff platforms. TSMC also validated Cadence 3D-IC technology for its CoWoS (chip-on-wafer-on-substrate) Reference Flow; the companies developed a CoWoS test vehicle that includes Cadence Wide I/O memory controller and PHY IP.